This subdued take on fashion week's bright eyes, bold lips has been adapted for everyday Orlando wear. Color was layered over a natural look of the same day. Inspired by previous couture makeup trends, this look is soft and subtle enough for work. Preparations: Neutrogena moisturizer; Blistex lip balm; Studio Fix Fluid Foundation; Studio Sculpt Concealer; Studio Fix Powder. Eyes: Shadow - Yogurt under brow, Malt in inner corner of upper lid to center of lid, Wedge in outer corner and remaining part of the lid, Concrete in crease; Molasses liner in a very thin line on upper lid above lash line; Wedge in inner corner under lower lash line, Concrete in outer corner of lower lash line. 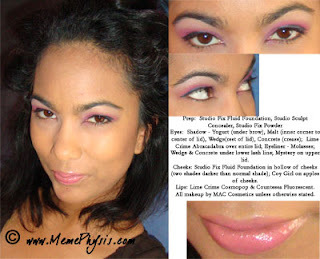 Cheeks: Studio Fix Fluid Foundation two shades darker than skin tone and normal shade in hollow of cheek. Lips: Stripdown lip liner, Curiositease lipstick, Cultured lip glass. Lime Crime Abracadabra was patted on the eyelids with a stiff bristle brush. MAC Cosmetics Coy Girl was added to the apples of the cheeks. Lime Crime lipsticks in Cosmopop and Countessa Fluorescent were layered over the lips. This look is very simple and nice to wear daily. To spice up the color scheme for evenings, just layer the new color over the old, and the definition from the original scheme should add depth to the new color. If you would like to adapt this look using Mary Kay, Avon, Maybelline, or any other brand, you can schedule a consultation to discuss how you can make the most of your makeup and your best colors. Walmart, Target, CVS, and other similar places offer cosmetics at affordable prices. Unless otherwise stated, all products are from MAC Cosmetics, which can be purchased at the MAC store in Florida Mall and Mall at Millenia as well as some major department stores or online. Is there no etiquette in friendship?